In 1957, the Soviet Union launched Sputnik, the first man-made satellite. In 1958, the United States followed with Explorer 1. Today, there are more than 1,000 of these large satellites revolving around the Earth sending radio signals back to us, which get converted into pictures of the oceans, weather forecasts and even DISH TV. Many of these satellites are the size of a 7,000-pound hippo and can take decades to design and build. But rocket scientists have now found ways to make satellites faster and cheaper. At Georgia Tech, professors are turning their attention to the micro level, getting ready to launch the first of six nanosatellites, or “CubeSats,” into space later this year. At Georgia Tech’s Engineering, Science and Mechanics building, aerospace engineering professor David Spencer is working on a micro-satellite that will be the school’s first complete spacecraft: Prox-1. 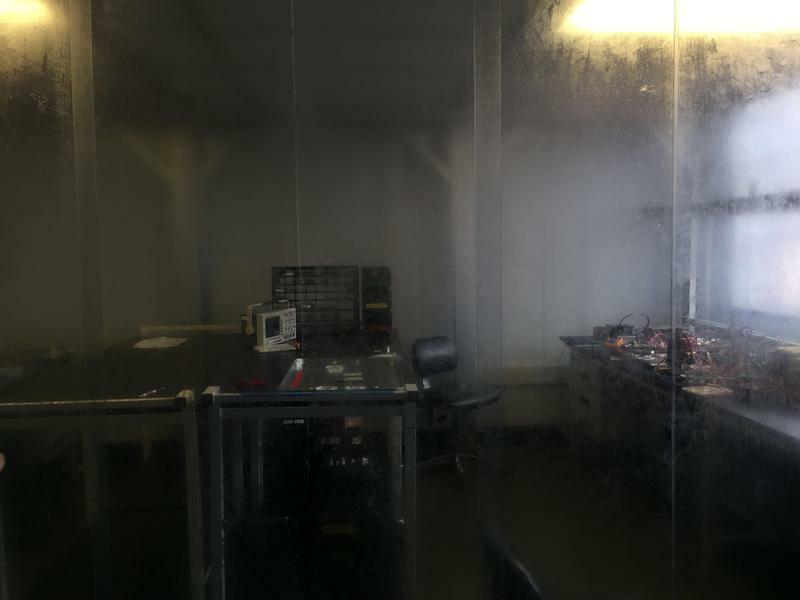 The pieces of Prox-1 are laid out on a table in the school’s flight harbor lab, which includes a clean room, partitioned off with plastic. It’s an area that’s off-limits if you’re not wearing a lab coat and hairnet. Georgia Tech student Christine Gebara is the chief system’s engineer for Prox-1. She shows off a micro-controller being prepped for space. Aerospace engineering senior Christine Gebara is the project’s chief systems engineer. She shows off computers the size of an electronic chip. You can find some of these pieces inside a cellphone or laptop. Put together, it will be about the size of four shoeboxes. CubeSats are easier, faster and much cheaper to build than large satellites. Prox-1 is being funded mostly through the U.S. Air Force, which wants to develop and maintain a complete database of what’s in orbit right now. Georgia Tech computer engineering student Roy Blatt (foreground) and graduate student Zach Levine show off how optical lasers on Georgia Tech’s RANGE mission satellite could be used to send messages to a second satellite using binary code. It also wants to test out automated trajectory control – whether spacecraft can control themselves in orbit using mostly cameras and sensors. “We’ll be able to control the spacecraft from the ground, but have it basically control itself on orbit, relative to another spacecraft,” Spencer explains. Prox-1 cost $1.2 million to build and four years to put together. Spencer said it might have cost the Department of Defense $80 million. In space, Prox-1 will run on solar power and propel itself with a 3-D-printed gas thruster developed by Georgia Tech professor Glenn Lightsey. Inside Prox-1, there’s an even smaller satellite, known as LightSail–B or Lightsail 2, which will be ejected through a tiny door on the side of Prox-1. Prox-1 will then inspect the smaller satellite and take pictures of it as they orbit Earth together. A view of the clean room and flight harbor lab at Georgia Tech where Prox-1 is being prepped for space and assembled. There’s also a thermal infrared sensor provided by Arizona State University, which will help Prox-1 keep track of LightSail-B. This will be the first time these small technologies will be used in space. If it works, these tiny satellites could inspect the International Space Station or assist in getting supplies to Mars. Georgia Tech aerospace engineering major Kevin Okseniuk is one of 150 students who have worked on the project. He said building Prox-1 is giving him hands-on experience. 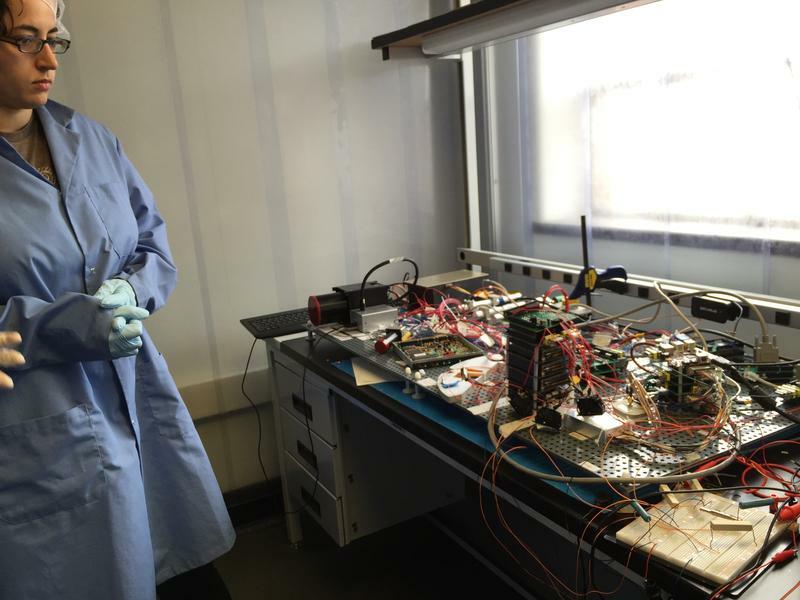 In another lab, assistant professor of aerospace engineering Brian Gunter is building a satellite even smaller than Prox-1. It’s called RANGE and stands for Ranging and Nano Satellite Guidance Experiment. 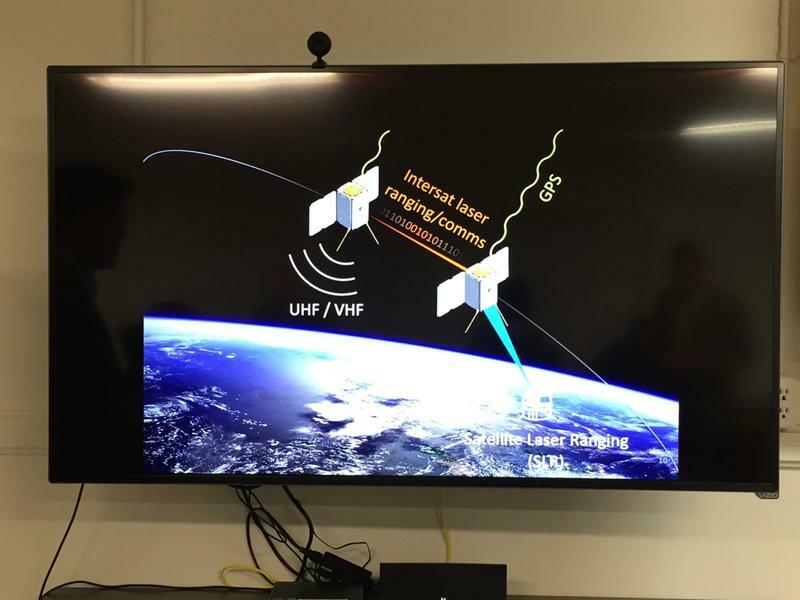 The RANGE mission satellites each weigh less than 5 pounds and will have an inter-satellite laser ranging system and an onboard GPS receiver. These CubeSats look like small metal boxes. Inside you’ll find a miniature atomic clock and GPS receiver. Gunter wants these two satellites to relay their exact location down to the centimeter back to Earth. He’s also testing a new communications system with tiny lasers using binary code – shooting ones and zeros back and forth. Thirty-four undergraduate and graduate students are volunteering their time on the $150,000 project. 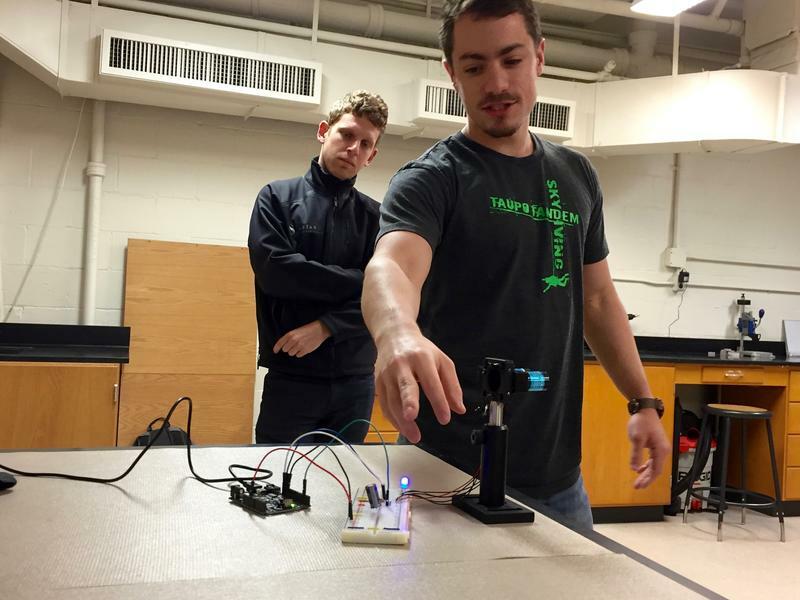 Two of them, Zach Levine and Roy Blatt, show off how a red laser beam would send signals between two satellites. “So basically right now, we’re converting text like you would read in a book to binary. 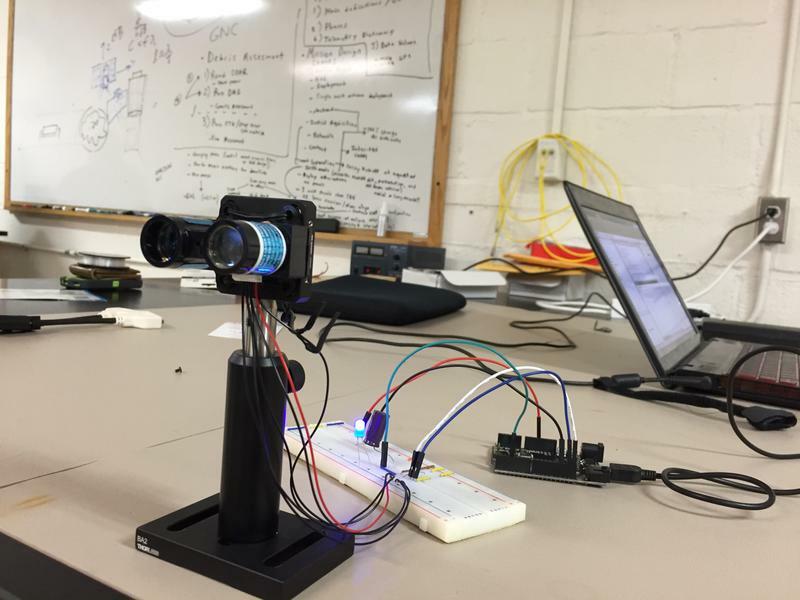 The lidar [small optical laser] is going to pulse that to the receiver and Roy is going to read it into his laptop, basically translate it back to text,” Levine explains. Because laser light travels at a constant speed, it can be used on the RANGE satellites to determine how far apart satellites are based on how long it takes for a laser pulse to travel to the second RANGE satellite. They’re trying to get the message “Skydiving is cool” from one satellite to the other by pulsating a laser beam. Right now, satellites use radio frequencies to communicate. Lasers would be a lot faster. Gunter’s dream is to send hundreds of small satellites into space to talk to each other and send images and data back to Earth. “This small technology, if you can miniaturize it and get the same capability as some of these larger satellites, you save a lot of money and you’re able to get better science return because they can go to do to these remote locations and do these fantastic measurements,” Gunter said. Professor Glenn Lightsey tests the satellites in a vacuum chamber that mimics the zero-gravity environment of space and builds a lot of the hardware. He’s a new addition to Georgia Tech’s school of aerospace engineering. He comes from the University of Texas at Austin, where he helped launched that school’s first small space satellite. Georgia Tech aerospace engineering major Christine Gebara shows off Prox-1, which cost $1.2 million over four years to build. “You really only have one chance for everything to work when it counts so you test as much as you can, as close as you can, to the real conditions so that you’re not surprised when you actually have to do it for real,” Lightsey said. In 2014, one launch ended badly. A NASA rocket headed for the International Space Station was carrying a $1 million micro-satellite his students at UT Austin spent more than a year working on. The rocket exploded seconds after liftoff. 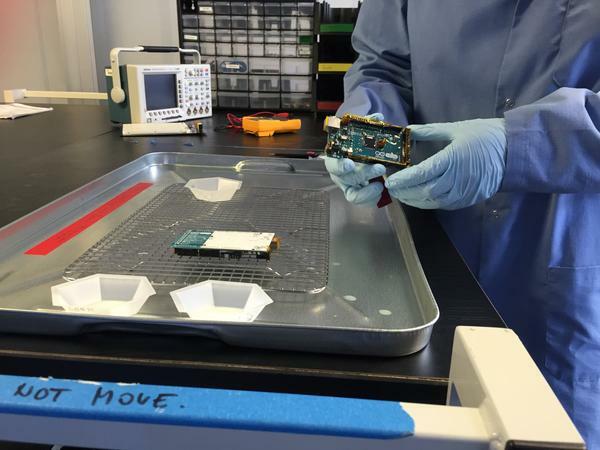 These small satellites often get a free “rideshare” through NASA or private companies like SpaceX. Lightsey said there are now more than 50 universities and even elementary schools building satellites. But he said Georgia Tech’s Space Systems Design Lab is notable for its focus on research. The RANGE mission is set to launch by the end of 2016 and Prox-1 will be ready for lift-off on a Space-X Falcon Heavy rocket carrying a dozen other small satellites in March 2017.